Let’s get one thing straight, Magic and pasta is alive and well on the Amalfi Coast. Fellini should know-- he loved the Amalfi Coast. This list is by no means exhaustive. You could eat for years on the Amalfi Coast and still have not tried every plate the region has to offer. Many of the same dishes are found in the the Gulf of Sorrento, Capri and the Phlegrean Islands. I have tried to limit this top ten list to foods that are strictly native to this wondrous stretch of coast and have stories linked to specific towns. Sfogliatella, for example, was invented in the Amalfi Coast town of Conca dei Marini. Parmigiana di Melanzane (Eggplant Parmesan), on the other hand is ubiquitous throughout all of Southern Italy and is a true staple of the Southern Mediterranean summer diet. To understand the foods typical to the Amalfi Coast, one must observe the region’s topography. Vertical as it is here, the bread basket of the region has historically been the town of Agerola, which was home to large fertile tracts of arable land. Originally inhabited by Iron Age Oscans, Agerola is the oldest town on the Amalfi Coast—though since the demise of the Duchy of Amalfi, Agerola no longer is considered an official part of the Amalfi Coast and its UNESCO world heritage designation. That being said, the Monti Lattari, the mountains that form the Amalfi Coast, were famous for their fertile pumice rich soil. The cows of the region produced wonderfully nutritious milk that was lauded by Augustus Caesar’s physicians. The name Lattari, derives from this celebrated milk. It was also though to inoculate locals from certain diseases. Indeed, the word vaccination comes from the Latin word for cow, vaca. To this day, Agerola produced the famous Fiori di Latte cheese that is used atop Margherita pizza. And until the 1950s, Neapolitan doctors often sent sick patients to Agerola to inhale the stench of cow dung in local barns. Thankfully, this is no longer a part of the gastronomic tours of the region. Another staple of the Amalfi Coast diet is of course fish. 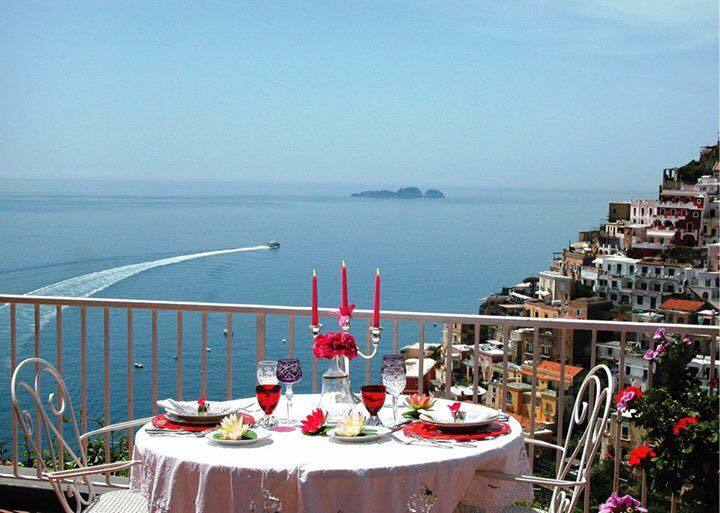 The towns of Positano and Conca dei Marini have world famous fish festivals every year. The patron saint of Conca dei Marini is San Pancrazio, not coincidentally a patron saint of fisherman. Above all else, the inhabitants of this region eat what is fresh and available. This is how the ancestors have eaten for generations and mercifully, not much has changed. The only kind of fast food you will find here is the kind that comes straight out the sea and is cleaned and fried immediately on shore. Below are my favorites, native to the region and timeless in their consumption. It bears noting that this is a dish available in nearly any coastal town of Campania. I include it as an Amalfi Coast dish because it is simply impossible to visit the region in the summer and not enjoy spaghetti and clams on a panoramic terrace with a glass of local Falanghina. You can order this dish macchiato (stained) with tomatoes or without. The real key is to ensure it includes vongole verace, local ‘true’ clams, and not the imported Manilla clams. Another flavorful (and less expensive) version of this dish is prepared with lupin clams, which are sweeter and smaller than the vongole verace clams. A little cup of fish. That’s the most apt translation of this ubiquitous summer food. 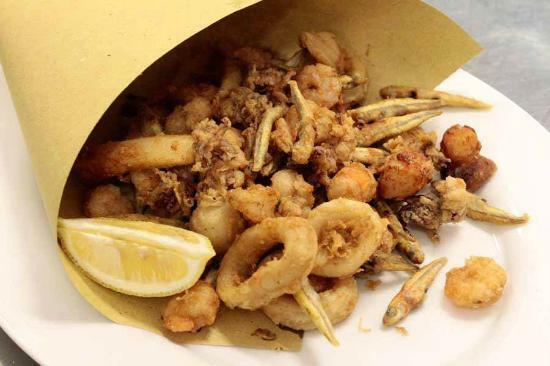 Folded up into paper cones, overflowing with mix fried fish and large sticks for eating, this is an Amalfi Coast classic. Look for places that fry the fish to order—never get the fried fish that has been sitting behind a sweaty glass window. Spritz with a fat lemon wedge and enjoy calamari, anchovies and paranza, a Mediterranean white fish. This is the ultimate summer street food, especially with a Nastro Azurro beer after a long day at the beach. Whether served with branzino or orata, this simple preparation of fish, tomatoes, olive oil, herbs and white wine is common across all of the Amalfi Coast. Literally meaning crazy water, this fish predation likely derives its name from the crazy combination of tomatoes and fish cooking liquid. Who knows…But order whatever the fresh catch of the day is and tell whoever is preparing it to not add potatoes. The potatoes soak up all the wonderful juice that seeps from the fish into the tomatoes as the dish cooks. That juice is the best part. Mop it up with a heel of bread in the time honored tradition of scarpetta and you will understand why Italians eat with their hands so often! The best lemons in the world arguably are from the Amalfi Coast and the Gulf of Sorrento. Their globular shape and mildly narcotic aroma will make you swear you have never heretofore tasted a lemon. This dessert, which is native to the Amalfi Coast and Sorrento, is one of the many beloved regional preparations featuring the heralded ingredient. 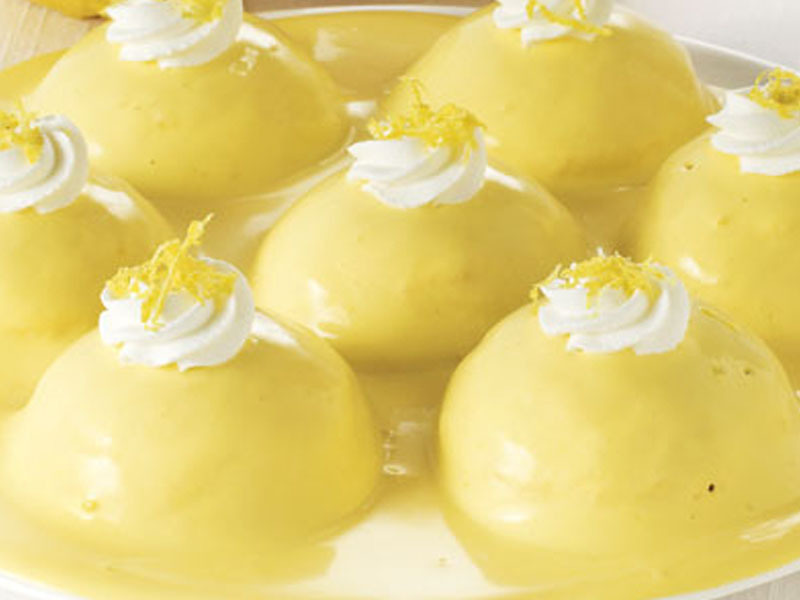 A dome shaped, lemon scented sponge cake is covered with a lemon zest frosting and served slightly chilled. When faced with the difficult decision whether to order dessert or not, delizia di limone will compel you that there is really only one acceptable answer to this predicament. And that answer is a resounding YASSSS! During the height of the Duchy of Amalfi, towns including Conca dei Marini, Positano and Praiano were rustic fishing villages. That is hard to imagine now considering the glitz and glamour surrounding this world renowned tourist destination. Yet each town’s cuisine reflects the Amalfi Coast’s humble fishing roots. The town of Praiano, just south of Positano is in fact famous for this dish of squid and potatoes. You may be accustomed to the ubiquitous fried squid found in sports bars throughout the States. This dish will remind you that squid is not simply a fried snack food. 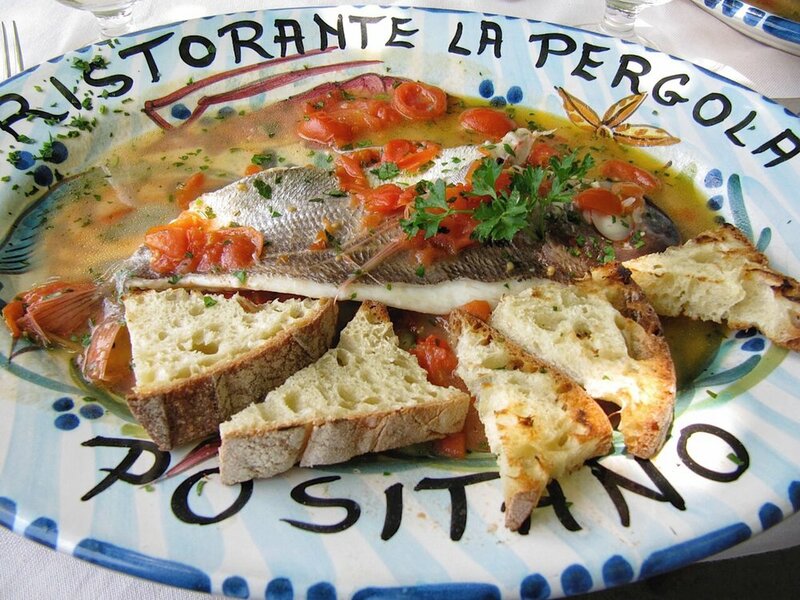 It is a soulful entrée that fisherman along the Amalfi Coast have enjoyed for years. In the 18th century a group of cloistered nuns at the Santa Rosa convent in the town of Conca dei Marini combined ricotta, candied fruit, limoncello and semolina in a shell shaped puff pastry and thus a culinary star was born. These nuns, as many in the area, invented the dish to avoid throwing away excess ingredients, never expecting to create such a culinary sensation. The traditional version of sfogliatella is served ‘riccia,’ named for its curly appearance and crunchy texture. As legend has it, this version was difficult to eat for people who had no teeth (dental hygiene was less than spectacular in the days of Bourbon rule), so local bakers invented a ‘frolla’ or smooth version. Both are delicious, but the orginal ‘riccia’ version will always reign supreme. It also makes a royal mess when you eat it so be ready for a whole lot of flying pastry shrapnel. Heading to the mountains above the Amalfi Coast, you will find the mountain hamlet of Agerola. Here cheese mongers produce the famed Fiori di Latte cheese which is typically used to make a Neapolitan Margherita pizza. Lamentably, many of the producers of this cheese have resorted to industrial production methods that do not utilize the milk of local cows—in fact some even use powdered milk. YUCk! But, the famil- run Caseificio Naclerio produce some of the best Fiori di Latte in the region, using the milk of their own cows. Simply drizzle a bit of olive oil and sea salt on this fresh cheese and you will understand why Caesar’s physicians thought the milk of these mountains was magical. This fresh pasta is slightly wider than linguine and about a quarter of the length. 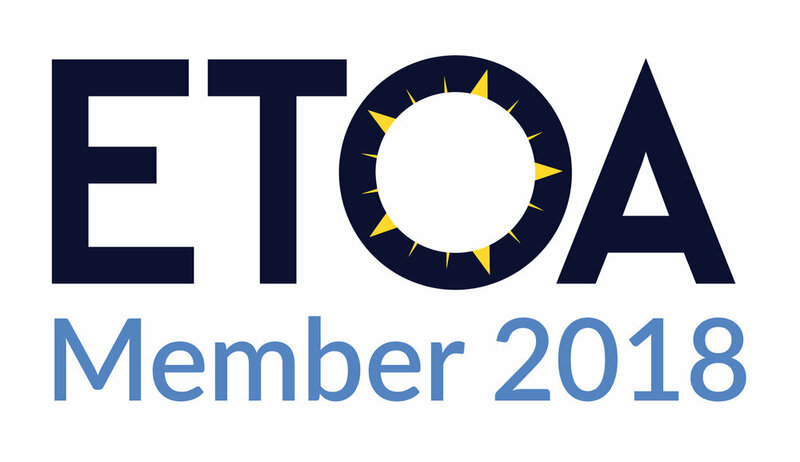 It literally means to enjoy (scialare) in a pan (tiella) in Neapolitan dialect. Amalfitano Chef Enrico Cosentino invented it in 1978 at a cooking competition but in all likelihood some crude early version of it existed in traditional household kitchens throughout the region. This shape of pasta is ideal for seafood based sauces as they are light and perfectly soak up rich seafood broths. A favorite springtime preparation involves sautéing baby zucchini with locally caught shrimp and tossing in a rich seafood stock. You will also find with any number of mixed seafood including mussels, prawns and clams. The region surrounding the Amalfi Coast has been world renowned for its grain production since before the Middle Ages. Notably, the rivers that flowed down the Lattari mountains from Agerola to Amalfi and from Ravello and Tramonti to Minori led to the booming commercial success of the Duchy of Amalfi. Amalfi was a paper producer. Ravello was a silk manufacture. Minori, like Gragnano on the other side of the mountains, became a grain and pasta producer. From this tradition emerges the Ndunderi di Minori. These delicate pasta pillows resemble gnocchi, yet are made without potato. Thusly the ricotta, farina caseata (farro flour) and egg mixture render these little blobs of goodness all the more delicate. Locals have made a version of them since Roman times and decidedly keep the master recipe secret. You will just have to visit Minori and try them for yourself. Admittedly, I was a little taken aback when I first tasted this dessert of chocolate and eggplant. I had heard of cinnamon and eggplant in savory dishes, but never of chocolate eggplant served ostensibly as a dessert. Since the days of the Duchy of Amalfi, invading Saracens knew the region was blessed with particularly sweet aubergines. Later, according to one legend, Augustinian nuns gifted a basket of sweet summer eggplants and chocolate to Tsar Nicholas’ nephew after the birth of his son at the Grand Hotel Cocumella di Sant'Agnello on the Gulf of Sorrento. This lead to the preparation of the eggplant chocolate sweet that the visiting Russian court adored. In another version of the story, monks of an ancient abbey of Tramonti fried aubergines and then seasoned them with a sweet liqueur mixture. Later locals of mountain top Tramonti and nearby Maiori replaced the liquor with chocolate. Today the sweet is deeply connected to Maiori local culinary tradition and is typically eaten at the town’s Feast of the Assumption, which is also known as Ferragosto on August 15th. Many locals enjoy this dish all summer and often decorate with bits of candied citrus. Nearly at the bottom of the Amalfi Coast, the tiny fishing borgo of Cetara has been producing a fermented fish tincture for the past several centuries. Colatura of Cetara is loosely related to the ancient Pompeii produced fish paste of Garum. Today the fish oil is prized for its bold umami flavor that locals use to enhance fresh seafood pastas. Similarly the anchovies of Cetara, which are used to make the Colatura, are highly prized throughout the region. Whether you order marinated or fried, the Cetara anchovy is a thing of briny beauty.